A short day trip from Kagbeni takes you to the Bon town of Lupra. The trek can be done in a loop, ascending and crossing the main Muktinath footpath above Ekalaibhatti and going towards the mesa to Lupra. 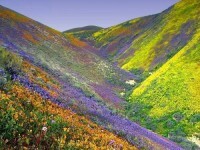 The trip is accompanied by the beautiful Himalayan pheasants and blue sheep that are seen on the trail at times. There is a cave at the base of the river, approximately fifty meters above it, before crossing to the Lupra side. The cave is used for long term meditation that could lasts from thirty days to six months or even more. A young monk named Yong who was schooled in India serves as a caretaker of the cave and prepares it for other’s meditation. The cave has a balcony with a seating area for meditation, a small cooking area and sleeping quarters with shelving, however, the upper level where the heavy duty isolated meditation takes place includes a very small area with a four foot ceiling, three feet deep and even less across. Also, a slot to insert food and drink for the monk is there and the monk who had meditated here once for thirty days accepts never wanting to do it again. 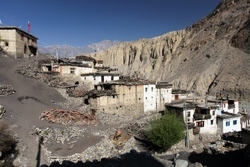 The newly renovated gompa a little above the main road across the river to Lupra is also one of the major attractions here. The Bon religion is said to predate the Buddhism. From here, to get back to Kagbeni, you can also get a jeep that passes through EKlaibhatti, a small town named after the original Lonely Inn. You can also go straight up to the rock hound through the goat herder’s path, the area that offers a good variety of rocks like Shaligrams (holy black ammonite fossils) as you go higher. Also a taste of thongba (local beer) and delicious lunch at the Blue Sheep Valley Inn will help you forget your tiredness. It takes you about four hours to complete a round trip to Lupra and about six hours for a roundabout trek to and fro rock hound and Kagbeni.